These are Manneco's most economical strings of C-7 & C-9 light lines. 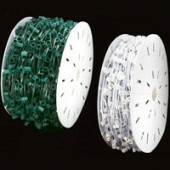 They are sold on spools of 1,000 feet and are made with molded sockets on 18 gauge SPT-1 wire. They're available in either green or white.